This snow leopard is on her way to social media stardom thanks to her incredible reaction to being caught on camera. Jessie spotted the new CCTV camera in her enclosure at Paradise Wildlife Park for the first time after waking from a nap – and it’s fair to say from her adorable reaction she was a little surprised. According to staff at the park in Hertfordshire, Jessie’s surprise didn’t last long – she went up to give the camera a bit of a sniff before settling down for another nap. 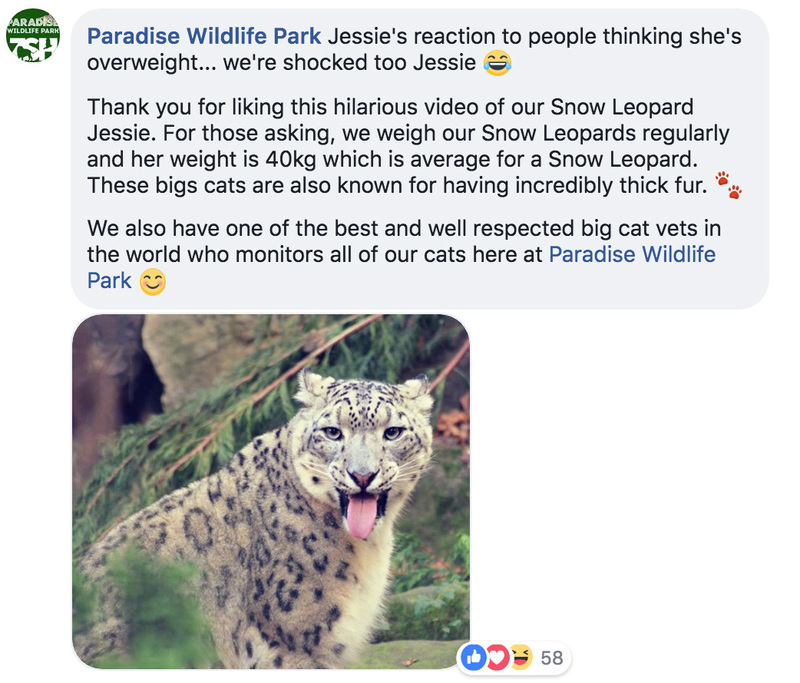 The clip was a big hit on Facebook, where it had been viewed nearly 150,000 times as of Wednesday afternoon – although staff were surprised to see some commenters suggesting Jessie looked overweight. Jessie, who is four years old, is one of two snow leopards at Paradise Wildlife Park, along with Panja. Keepers hope the pair will breed at some point over the next couple of years.